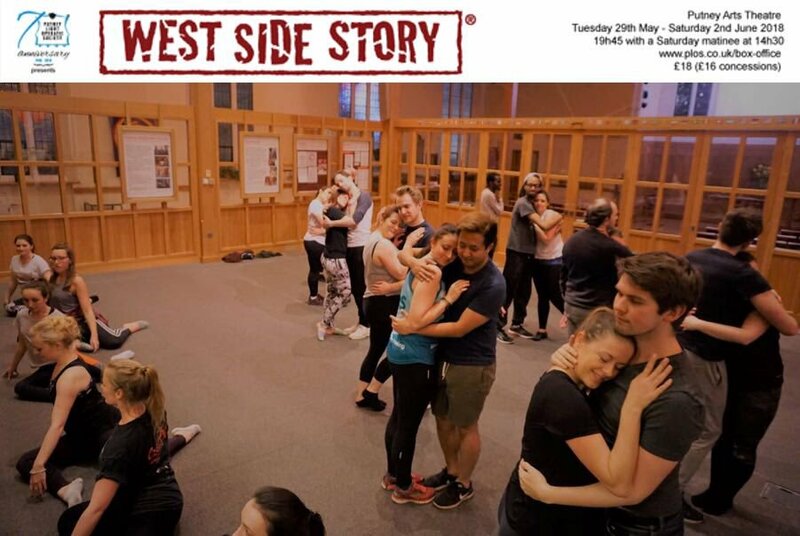 West Side Story is a classic musical and one I know well having choreographed it, albeit several years ago. I was therefore delighted to attend when I received the invite from Putney Light Operatic Society. 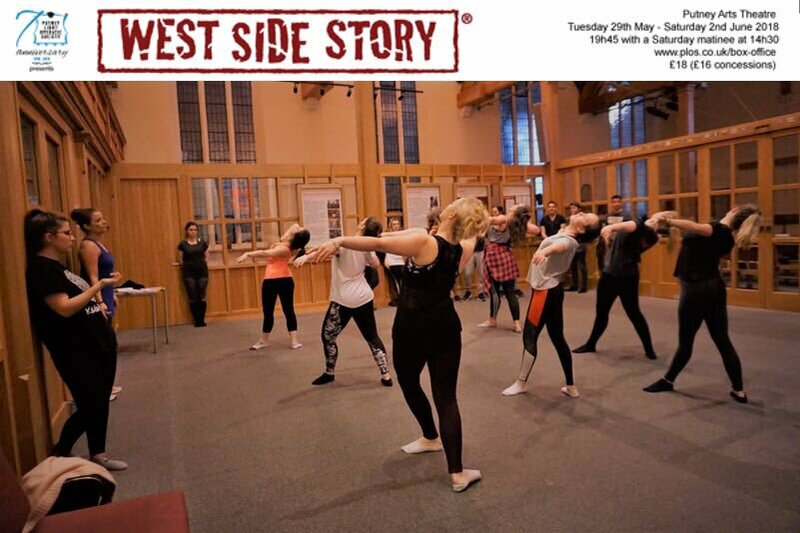 West Side Story is based on Romeo & Juliet but set in 1950’s New York. It focuses on rival gang’s, The Jet’s a group of American teenagers and The Shark’s, a group of Puerto Ricans. The Jet’s former leader, Tony, meets Maria, the sister of Bernado and The Shark’s current leader and love overwhelms the hate however for those around them the divisions are already too wide. Tony and Maria are the focus of this story. Maria is beautifully played by Katherine Skene who has a stunning soprano voice, a consistent and believable accent and an endearing warmth and innocence in her portrayal of Maria. Unfortunately Will Poyser’s Tony is not as successful. He struggled with a lot of the pitching in this demanding vocal role and lacked the strength in his upper register needed to do this part justice. He also lacked the gravitas needed for the audience to believe that he founded The Jets and had the respect of the rest of the gang. I must also mention Bianca Lloyd-King who played Anita. She was a great mixture of feisty yet devoted to Bernado and her duet with Skene during ‘A Boy Like That/ I Have A Love’ was one of the highlights of the show. 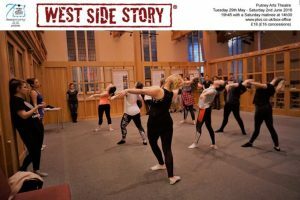 Dance is always a huge part of West Side Story and the choreography is notoriously tricky as the Jets and the Sharks need to look both tough and cool whilst performing the choreography and Officer Krupke was a perfect example of this. However at other times more conviction and self-belief was needed from the cast in numbers such as ‘Cool.’ There were also moments where the entire cast was used to perform the numbers where it would have been more effective to use a handful of the best dancers. The start of the ballet sequence was a prime example of this and when the majority of the cast left the stage and the stronger dancers performed the remainder of the ballet, the dance had a much bigger impact. Musically the show was strong with a 12 piece band lead by Harriet Oughton as Musical Director. The band created a great sound with some tricky rhythms and the band was well balanced with each others as well as the singers. The ensemble also sounded strong when they performed together and a lot of work had clearly gone into mastering many of the difficult harmonies. Finally I must mention the set. 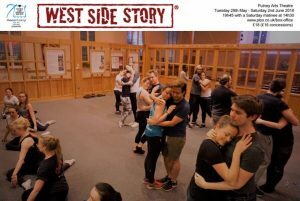 It was simply set out as a playground with graffiti, a basketball hoop and some metal fencing but the simplicity meant that the cast could utilise the whole stage whilst still giving it the down tow New York feel. Well done to PLOS for taking on this challenge of this difficult show. Despite the huge set pieces it is Katherine Skene as Maria whose simple portrayal and stunning vocals stole the show. To find out more about PLOS visit their website. If you liked this review you might also like my review of Pippin by SEDOS, Betty Blue Eyes by PLOS and A Murder Is Announced by Cygnet Players.